The first message of the day is to our colleague and friend Mick Best – who is in Australia – and it is from all the gang at the Racecourse Station: our ‘Best Wishes’ (apologies for the usual weak pun), ‘Get Well Soon’ and we look forward to hearing your version of ‘The Crystal Chandelier’ (again)! Elsewhere, Terry and I were into further clearance at the top of the Platform 1 bank – where having removed the live vegetation we are left with the dead stuff and, irritatingly, accumulated rubbish: heaps of polystyrene cups, plastic bags etc. My suspicion falls on nearby stall holders during the Cheltenham Festival who may ‘accidentally’ have left their waste behind. Grrrr – not how we want to spend our Saturday monrings! Anyway, it’s all looking much tidier and, like all these tasks, will be so much easier now we can keep on top of it. So here is another view of Freightliner 1995 plus the increasingly impressive ‘entrance’ to Platform 2 – courtesy of Pete and the gang from Building Services. And finally, another diesel snap plus a shot of Colin doing his David Attenborough impression in the forest around the Klargester pit. So with that, and a general feeling that another railway season is drawing to a close………..it’s goodbye from me and it’s goodbye from them. As promised a couple of images from the work ongoing this morning at the station for the blog. Above Ros is planting spring bulbs on the embankment above Platform 2 (the ground is like concrete, hence the post hole digger). The second image is how far I have managed to proceed with the repair to the lower front panels of the Ticket Office – between digging holes for bulbs that is. The damaged wood has been treated and hardend. A new sloping surface has been created with fibreglass to ensure that the water runs off the bottom rail and does not collect in the joint with the panelling as before. Another few hours of preparation, filling and priming will be required before we can apply a weatherproof topcoat. 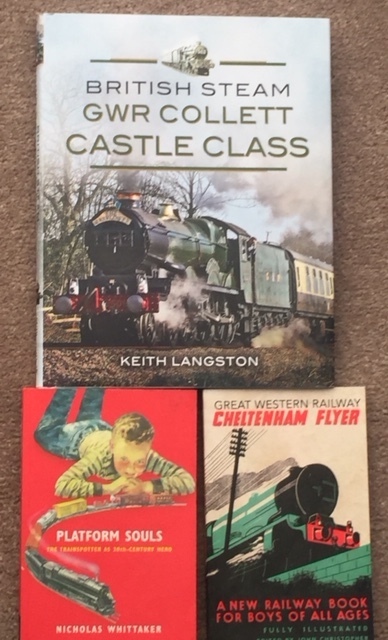 My thanks to John Leeson for manufacturing new corner pieces for me on planed timber kindly donated by Messrs Bence and Sons and to Dave Griffin for making a special journey to get me a new tin of primer when he had many other tasks to do yesterday preparing for the Diesel Gala. Wednesday 4th October 2017 – Hadrian’s Wall?